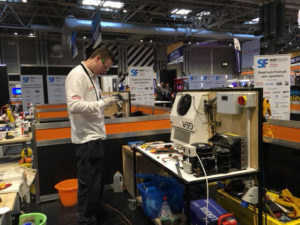 The 2019 cycle of SkillFRIDGE, the skills competition dedicated to engaging the next generation of engineers and raising the profile of the RACHP industry, will soon be underway when registration opens on 1 March. Nurturing the RACHP engineers of the future while putting the focus on safety, best practice and new technology, SkillFRIDGE aims to tackle the skills crisis head-on, helping to cultivate a knowledgeable, innovative and inspired workforce. For those taking part in the UK-wide contest, sponsored by renowned industry heavyweight Toshiba Carrier, it’s a unique opportunity to develop an invaluable, life-long skill set. “It’s a career-boosting platform”, says lead judge Mark Forsyth. While the benefits that SkillFRIDGE can bring to its participants and the wider RACHP industry are clear, the impact of the competition – and others like it – has the potential to be even more far-reaching. The specialist RACHP skills contest is delivered in association with WorldSkills UK, a Department for Education-funded partnership between businesses, education and government that aims to accelerate young people’s careers, bolster the reputation of apprenticeships, and ultimately safeguard the UK’s economic future. WorldSkills UK is doing just that, working to meet the increasing productivity and competitiveness challenges that the UK faces in the midst of a skills crisis, and in a world defined by advancing technology. Not only can SkillFRIDGE help to alleviate the engineering skills gap – which sees an annual shortfall of 55,000 engineers – but it is also part of a crucial movement to invigorate the UK workforce as a whole. Aligning your business with the competition is an opportunity to show your support and be part of something bigger, while promoting your brand to the next generation and industry at large. To find out more about the range of sponsorship packages on offer, contact Karena Cooper on 01622 699150 or at kcooper@datateam.co.uk.